Have time to spare? Click here to learn how you can volunteer your time and talent to Montalvo! Come visit Montalvo and learn more about our historic property and vibrant arts center! Walking tours are led by volunteer docents and discuss Montalvo founding benefactor Senator Phelan, his life and his friends, the arts center then and now, and more. Note: Tours include steps and grades. ADA and ASL tours for the hearing-impaired are available by prior arrangement. These special docent-led tours also include a trail hike with a Santa Clara County Park Ranger. Wear closed walking shoes and layered clothing for your comfort. Monthly tours are scheduled throughout the year; click below to see the schedule and reserve a space in the next tour. These shorter tours (only one hour long) are offered Wednesdays in July and August at 10:30am prior to our Summer Luncheon series. 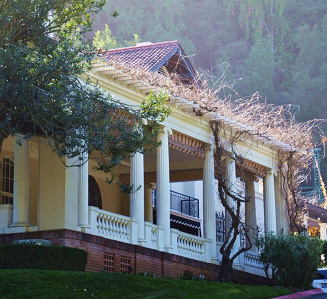 Come learn a bit about Villa Montalvo’s history and architecture before sitting down to a lovely lunch on the Front Veranda. Click below to view available days and buy your ticket today. Note: tours may be booked separately from luncheons. Take an hour-long tour during our Yuletide Marketplace! These docent-led tours of the Villa begin at 11am & 1pm on the Friday and Saturday of the Marketplace (November 16-17). Free for Montalvo members and one guest; $20 per person for non-members. Tours last approximately two hours. Recommended for ages 12+. Tour size is limited and advance reservations are required four business days in advance by calling the Montalvo Box Office at 408-961-5858. Tours may also be available in Mandarin and Russian, by request. Hike Montalvo on your own, as thousands do every year. Our grounds are open seven days a week (except for special events, which are posted). Download the self-guided tour map to hike all the trails and learn about points of interest along the way.